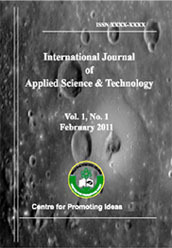 The journal publishes research papers in the fields of science and technology such as Astronomy and astrophysics, Chemistry, Earth and atmospheric sciences, Physics, Biology in general, Agriculture, Biophysics and biochemistry, Botany, Environmental Science, Forestry, Genetics, Horticulture, Husbandry, Neuroscience, Zoology, Computer science, Engineering, Robotics and Automation, Materials science, Mathematics, Mechanics, Statistics, Health Care & Public Health, Nutrition and Food Science, Pharmaceutical Sciences, and so on. IJAST publishes original research, applied, and educational articles in all areas of science and technology. Special Issues devoted to important topics in science and technology will occasionally be published.